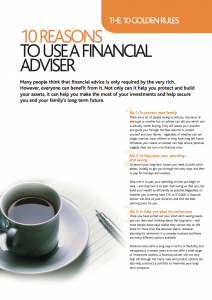 Vision provides fully independent financial planning advice to both individuals, trustees and businesses on how to best meet their financial objectives. Independent Financial Advisers are able to select the correct product for customers from using a comprehensive and fair analysis of the relevant market – this means that we can recommend any product from any company provided it suits the customer’s needs and objectives. With such a wide choice of companies, investments and saving tools, our customers can be reassured that they are not simply being provided with a standard recommendation but instead are receiving personalised advice.